National Night Out...Tuesday, August 7, 2018. BOVIA focuses on residents working together for change and improvement such as neighborhood safety & security, beautification, social activities and by looking out for each other. Membership in BOVIA is voluntary, dues are not required of residents who choose not to join, it does not create rules or regulations and it does not maintain any common property. BOVIA does not have any authority to enforce covenants, conditions, and restrictions (CC&Rs), but does attempt to reinforce homeowners' CC&R responsibilities through advocacy, communication, cooperation and concern for our neighbors. The BOVIA Board of Directors serves as volunteers, giving of their time for the benefit of Bay-O-Vista. The Board meets the fourth Wednesday of each month at the Main Library, and conducts General Meetings in the Spring and Fall. BOVIA publishes several newsletters each year, some to members only, some to all residents. Neighborhoods and neighbors are an important part of what creates a feeling of community. 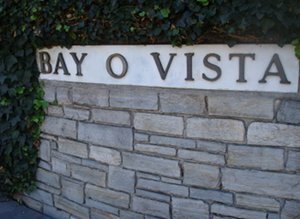 Dynamic associations, like Bay-O-Vista Improvement Association, contribute to a strong sense of community and create an opportunity for residents to get to know one another. Our association dates back to the late 1950’s, when the first of its 18 tracts and homes were developed. Nestled in San Leandro hills, Bay-O-Vista encompasses the portion of City located east of I-580. It is unique among San Leandro neighborhoods because of its rolling landscape and panoramic views. The neighborhood is characterized by mostly single story ranch homes on relatively large lots with panoramic views. Although many homes date back to the 1950’s, the majority of Bay-O-Vista was developed during the 1960’s and featured custom built designs that maximized the beautiful westerly views toward San Francisco Bay. Along with its convenient location, this friendly neighborhood enjoys the convenience of easy freeway access and access to Lake Chabot Park.